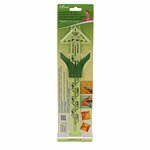 Effortlessly cut, mark, and stitch square or square triangles without ever cutting a triangle, or guessing at the sizes. Use NoHassle Triangles Gauge to make five block sizes for both triangles: 212 64 mm, 312 89 mm, 412 114 mm, 512 140 mm,and 612 165 mm. Reference left side of gauge for square and right side for square triangles.